FORGET THE WAFFLE BOWL, NOW YOU CAN GET YOUR ICE CREAM IN A CHURRO BOWL! @ NITROLADO - GARDEN GROVE - EAT WITH HOP! It's time to introduce to y'all the Churro Bowl! Here is a churro bowl filled with freshly made gelato by liquid nitrogen that my friends got! They topped it off with chocolate drizzle and fruity pebbles. Yumm.. I think my it was a sugar overload for my friends though because the chocolate drizzle made it too sweet. I'd suggest to ask for the staff to go easy on the drizzle next time! As for Kevin and I, we got the Oreo Cheesecake gelato topped with fruity pebbles, a whole Oreo, and wafer sticks! MMmMMM! Of course, gotta get it all inside the churro bowl! What I like about the Churro Bowl is that it's not hard as rock. It's swirled in layers and it is also soft, so it's actually quite easy to tear it off with every bite of ice cream! Great combo! 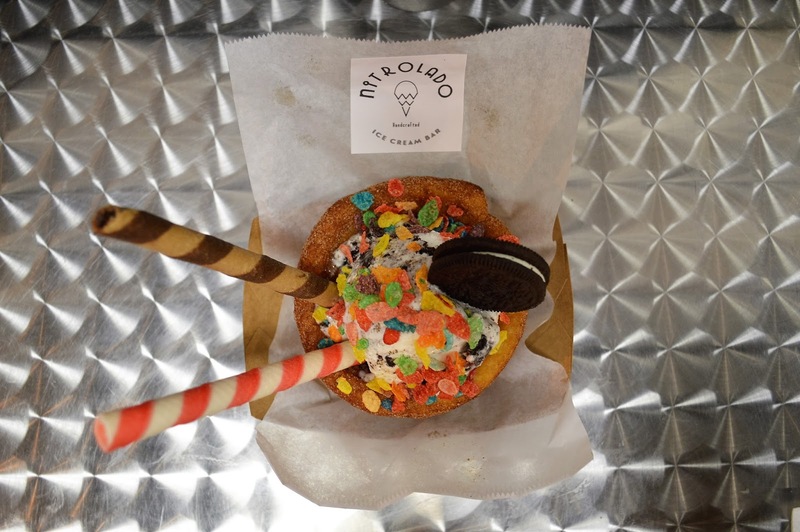 Nitrolado is a dessert shop that specializes in making fresh ice cream using liquid nitrogen. It's like watching a show before you eat your dessert! 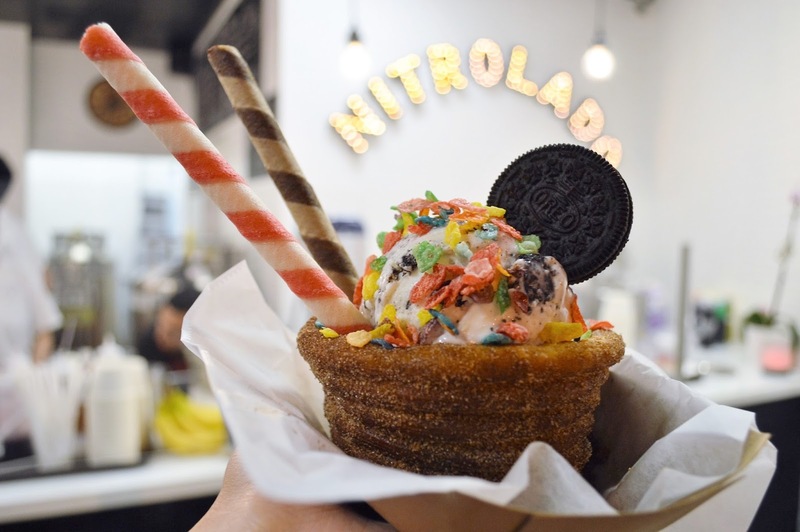 Unlike Creamistry and other places, Nitrolado allows their guests to choose toppings by the weight. It resembles Yogurtland in the way that you can choose however much or however little toppings and it's all by weight (about 40 cents / oz). You then choose your ice cream flavor and it's all made in front of you with liquid nitrogen. Dry ice is added into the bottom of the cup so that your dessert has a 'smoky" effect and your dessert is also kept cold at the same time! Nitrolado doesn't stop getting cool though. 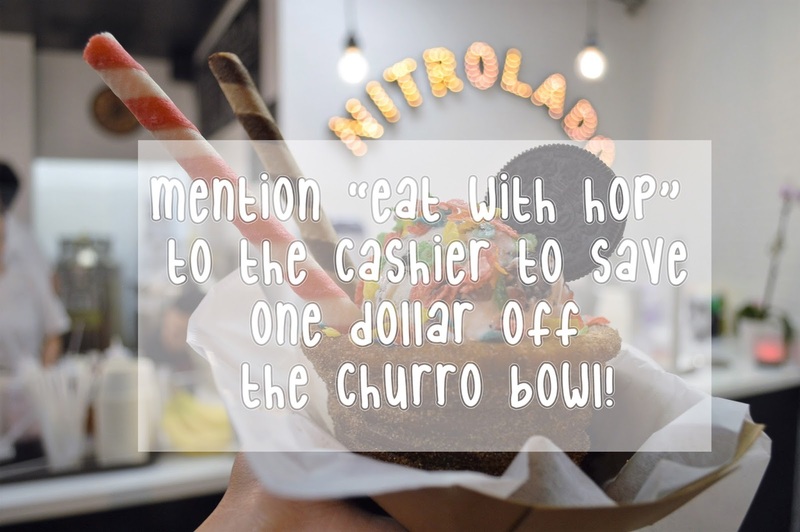 The Nitrolado team aims to change the dessert game by introducing the Churro Bowl! And I was able to try it finally! I love churros and this was definitely game changer! Like, seriously! I wasn't sure what to expect because I had tried the "Churro Cone" from Chikalicious in New York City. That was a disappointment in the fact that it wasn't churro-like at all! It was more of a croissant. I would rather Chikalicious rename it to the Cinnamon Croissant Cone or something.. CCC ? C-squared? The point was, Chikalicious lowered my expectations for churro - cup - bowl anything. However, Nitrolado was on point with this creation. The Churro Bowl is much more accurate in texture to a churro in comparison to the "Churro Cone" from New York. It's also very cinnamon-y and has the soft-chewy feel like the doughy part of an actual churro. Delish! It does have a bit of a crunch although not so much like a real churro. But at least that means the bowl isn't hard as rock. You can actually tear it very easily in swirls (like a cinnamon...bun..?) to eat with every bite of ice cream. What a treat! Oh. 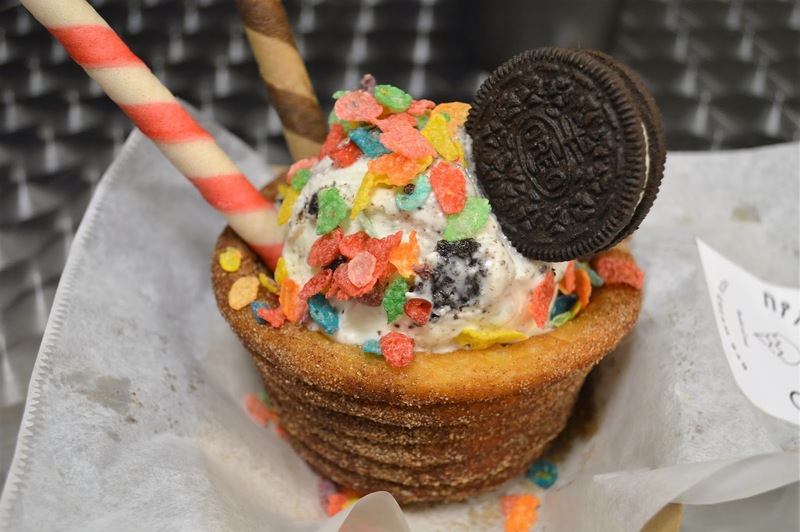 And there might be an Oreo Churro Bowl in the future here. And yes, You can say you heard it from me. Because you're cool like that and get your food news from here. *Churro bowl is available everyday! Update 9/15: Nitrolado now offers 5 churro bowl flavors! *In the Rex Plaza which is across from Tastea. Get $1 Off by mentioning Eat With Hop at Nitrolado!